Can You Lose Weight By Drinking Buttermilk? 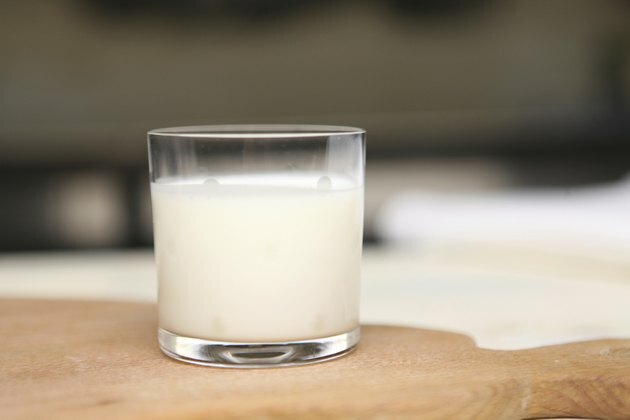 A glass of buttermilk doesn't serve as a magical weight-loss elixir, but this tart beverage can play a role in your effort to shed a few pounds. Don't expect that sipping buttermilk will automatically cause you to smile on the bathroom scale. Enjoying this drink as a healthy alternative to snacks or consuming it instead of higher-calorie dairy products, however, can pay dividends. Your body's ability to lose weight is a result of the relationship that exists between the calories you take in and those you expend. You'll lose weight when the calories you burn through everyday activities and exercise exceed the calories you consume when you eat and drink. Because drinking buttermilk increases your caloric intake, it won't directly affect your goal to lose weight. It's possible to lose weight with the help of buttermilk if you use the beverage to replace snacks that contain more calories. One cup of low-fat buttermilk has 98 calories. A 1-ounce serving of plain potato chips, however, has 149 calories. By opting for a glass of buttermilk instead of a serving of potato chips, you're consuming 51 fewer calories. Swapping out a 12-ounce can of cola for buttermilk can save you 54 calories. Provided you make this sort of decision with regularity, buttermilk can help you reach your weight-loss goal. Plus, in contrast to the empty calories of chips and soda, buttermilk is a nutrient-dense snack, providing protein, calcium, potassium and vitamins. It can take some time to adjust to the tart taste of buttermilk, but replacing other dairy selections in your diet with buttermilk can help you control your caloric intake. One cup of low-fat buttermilk is lower in calories and fat than a cup of 2 percent milk at 122 calories or a cup of reduced fat chocolate milk at 190 calories. Buttermilk is also a lower-calorie alternative to many varieties of yogurt. A 6-ounce contain of low-fat fruit yogurt, for example, has 168 calories. Swapping higher-calorie snacks and dairy foods for buttermilk can lower your overall calorie intake, but you can increase your odds of losing weight by exercising more. Exercise is a vital component of a successful weight-loss regimen. Aim for 300 minutes of moderate-paced cardiovascular exercise every week to help your body burn enough calories to lead to weight loss. Why Is Buttermilk Good for You?